2. My favorite item in my closet is so many shoes, so few places to wear them! however, right now - i'm loving my carlos santana gladiator wedges even though it's too cold to wear them just yet! 3. reading a book, having a glass of wine, catching up on Realhousewivesis my favorite thing to do when I need to relax. that's a question on my mind as of late. It just occurred to me the other day while signing my purchase receipt " I'm going to have a whole new last name" It was a weird feeling and bizarre thought to have. Not bizarre as in unusual but bizarre in that I have been ME for 30 years. Perfected scrawled signature. Suddenly after one day in July, I will be a whole new person. 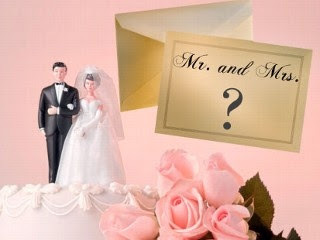 A "Mrs."
there is so much swirling in my mind right now! I have so many things I want to write about but can't seem to gather any of them into a cohesive post. that bothers me a bit. ***I've given myself a goal for next month to write EVERYDAY. it doesn't have to be profound or super long but I must write something. every. single. day. how will I ever get to be a published author if I don't practice? so that is my goal and I will do my best to stick with it. I want to have a 'themed' party right now! We're even 'borrowing' her Candy Topiary shown HERE to use as a centerpiece for the kid's table at the reception! Thanks Jessica! and this super cuteness how amazing is there proposal and story!??!! LOVE it! can't wait to see how it all comes together for her! I was enjoying the yummy margarita's that S's friend was hooking up as well as all the delicious eats while chatting with the family and singing along to the records the DJ was spinning- when nature called. After a quick trip to the bathroom I returned to the kitchen to discover two chicks hanging out around the blender. Figuring they were waiting for a re-fill I offered to go get the bartender/dj of the evening. He was busy so we improvised....... and the rest , as they say, is history. two (or four) shots later we are giggling and talking like we have known each other for years! These girls were my soulmates! Happy Valentine's Day!!! I wanted to join in on Mama M's Valentine's Extravaganza today as it is "10 thing I love about my love!" T-G-I-freaking -F y'all! It has been loooong week. and I am ready to throw in the towel! 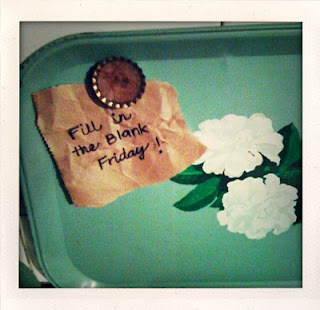 but first - it's time for a little Five Question Friday with Mama M! Rules: Copy and paste the following questions to your blog post, answer them, grab the blog hop code (if you'd like) and link up! We'd be your best friends if you'd link back to Mama M when you're done!!! 1. What is the one thing your love does for you that you can't live without? he gets up w/ Sweet Pea in the mornings on the weekend. it seriously makes all the difference in my personality of me sleeping just few more minutes. he also loves me inspite of all my flaws and idiosyncrasies. and I have more than a few believe you me. and he does the dishes. a chore i despise and for that- I will marry him. well that and about a million other reasons but that's pretty high up here on the list!!!! ahhh wednesday hump day! whew! made it halfway through another week! I tell you these days just keep flying by! good grief - it will be July before I know it! 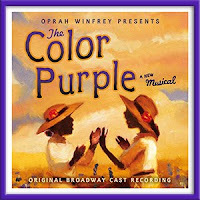 ***The Color Purple is playing now through February 28th at the Pantages Theater in Hollywood. I really would like to go see it but alas, it's not really in the budget. But please, if it's in yours go see it!! **** as much as we Californians complain about the rain and cold I'd much rather be here than here ***** Tonight we're having :Chicken with White Wine Sauce, Mushrooms and crumbled bacon it can be found here: I started the crock pot this morning so when I get home all I have to do is whip up some yummy sides and dinner is served! the craziness of the last few weeks have wreaked havoc on my workout routine. when I had to go out of town abruptly that threw me off. then I caught a cold upon return and the fact that I couldn't bend my head past my chin on my chest cost me another few days. By the time I felt half-way 'normal' - I discovered "On Demand" had deleted my 30 day Shred 2 & 3!! !1 What the heck! Now I'm forced to look for a new workout that will offer as much of a challenge in the same amount of time! Sheesh! After several minutes of scrolling I finally located yet another crazy Jillian Michaels workout : "No More Trouble Zones"
because it's tuesday and I have a list of things I am looking forward to this month! like to hear it? here we go: I have Yoga this evening with my Boo's whom I adore. sigh. Namaste. it is MUCH needed after several weeks of needing to re-schedule......It's Valentine's week!!! I love love. always have and being in love and on the way to matrimony is just bliss in my mind. I don't usually do a big "to-do" for Valentine's around my house; maybe just a candle here and there but this year I've decided to 'spruce up the house' with little bits of 'love' everywhere! Something about seeing all these random decorations cheers my soul.We are going to visit two potential wedding venues this weekend!!! Hooray!!! 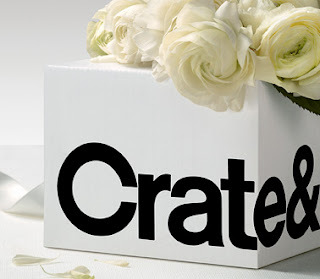 Club Wedd- $20 gift certificate if we start our registry with 10 items.....Watch out TARGET here we come! Y'all know what time it is right? that's right. 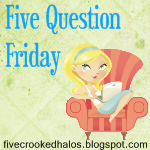 It's Five Question Friday with Mama M! The Fiesta edition! Why the Fiesta edition you ask? Well....... it's Friday, My Beloved and I are going out tonight - dinner and dancing with some friends to celebrate my dear friend Tiffany's 30th birthday!! I'm so excited! We've needed a night out! Then Sweet Pea has a party to go to tomorrow and then it's Super Bowl Sunday!!!! Let's Go Saints!!!!! hmmmm......good deep thought provoking question. I guess my answer would be - being hurt/in an accident or whatever with my kid around and not being able to get to /help her. that makes my heart race. that and being conscious while suffocating, catching fire or drowning. the whole I'm trapped and I can't get out situation? NOT the business for me. Holy. Horror. Batman! Remember when I told y'all about my lovely h.s. friend Elisa and how fabulous she was in helping me to find a wedding location? yeah. that. well yesterday she sends me an URGENT FB message to call her ASAP. and then she texts me. so I'm really concerned because this is unusual. so I call her. and she tells me what no bride ever wants to hear. the Rancho Capistrano is closing it's doors in 60 days. yes.60 days. How the heck is this going to work itself out!???? Apparently they are still offering to hold weddings but there will be NO catering waitstaff hospitality staff on-site coordinator linens all of the things I paid for in my deposit. I was reading my Redbook over the weekend and was intrigued by a survey question they had in their. How is the money split? Separate accounts? 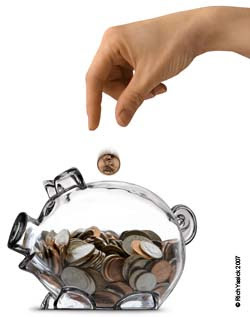 One joint account and one joint savings? Pay bills out of one account and use the other for "fun stuff"?? Simple questions really but one that sends most soon-to-be-marrieds into a tailspin. the ever challenging, necessarily evil ; Money talk. Because it has to happen. The union does not stop at the merging of the things and changing of the last name. Oh no, you have to work out your finances too. FUN. So needless to say we've been having the "money talk" as of late and it got me to thinking: How do you split up the money?? I'm curious to see if my friends out there fall in with the "majority" of the Redbook readers sampled for this poll.